The retailing giant's formidable assets are looking less valuable in a multichannel selling environment. 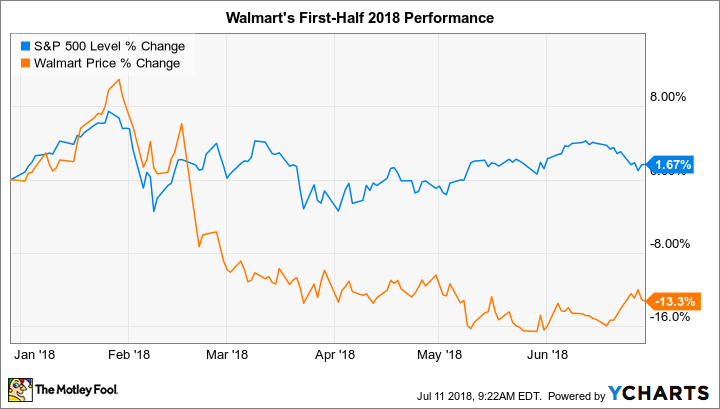 Walmart (NYSE:WMT) stock trailed the market through the first six months of 2018 by shedding 13%, compared to a 2% uptick in the S&P 500, according to data provided by S&P Global Market Intelligence. The slump has added to a rough run for the retailer's shareholders, as the stock has underperformed the market over the past three-year and five-year periods. Investors have been concerned about how the shift toward online sales might hurt the world's biggest retailing business, and those worries weren't put to rest in recent earnings reports. While sales growth was solid in the fiscal first quarter, for example, Walmart's e-commerce gains slowed sharply. Its operating income dropped, too, as the company continued an expensive acquisition strategy that this time brought it extensive access to India's digital sales channel. Walmart is evolving to meet the changing tastes of its shoppers, who are now demanding more home delivery options. Its valuable brand, global sales footprint, and huge financial resources give it key advantages as it navigates this difficult transition. However, the disruption occurring in the industry is set to hurt most companies' profitability. The world's biggest retailer appears to be no exception to that unfavorable trend.